Russian court sentences former judge to 7 years in prison in fraud case | Russian Legal Information Agency (RAPSI). 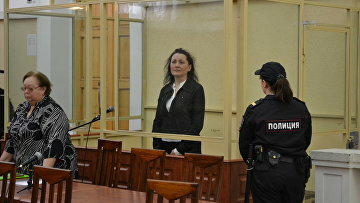 MOSCOW, December 7 (RAPSI) – The Rostov Regional Court has sentenced a former judge Svetlana Martynova to 7 years in a penal colony and fined her 500,000 rubles ($7,500) as part of a criminal case over fraud, the press-service of the court has told RAPSI. The court found that in 2011-2012 Martynova received 40 million rubles ($604,200) from two entrepreneurs for providing them assistance with obtaining an agriculture land in the Kuschevsky District of the Krasnodar Region. Yet, she did not fulfill her part of the deal and registered land in the name of her acquaintances and relatives. For a long time Martynova ignored calls from investigators and refused to come to a questioning several times, the press-service of the court noted. After she was indicted in absentia, Martynova was put on the federal wanted list. Later, she was eventually apprehended in Moscow. During the hearings she denied wrongdoing.